Rainy season is fast approaching here in Phuket, or at least I am hoping so. The crazy, hot heat is even too much for me! I dream of more rain. Yep, you read that right, I am ready for cooler weather. In my defense, this is the hottest time of the year on the island and I think everyone here is slowly sweating into human-size puddles. I am not looking for a huge snowfall, I just want it a little bit cooler. 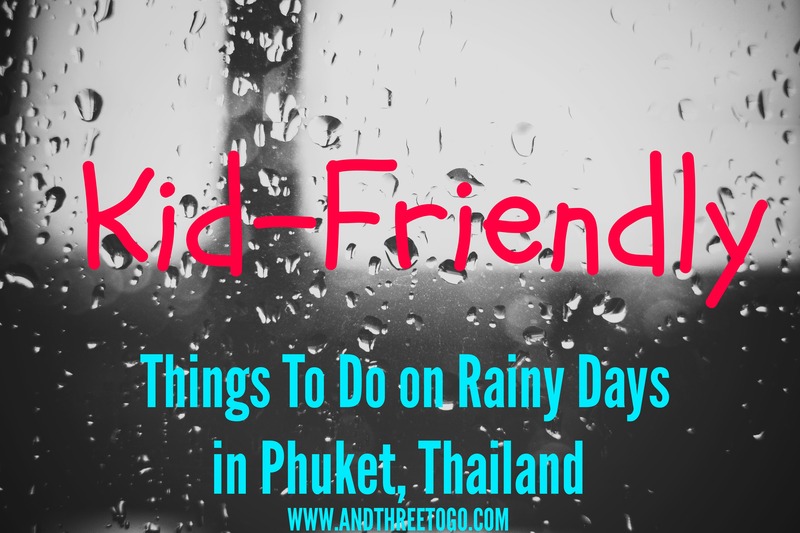 As I wish for the weather to cool, I figured writing about kid-friendly things to do on Phuket on rainy days would keep me patient while I wait for them to start happening. There are quite a few fun things that we have found to do on Phuket when the weather makes it uncomfortable to be outdoors. These places are wonderful for wearing your child(ren) out and staving off the stir-craziness that could happen if you are stuck in a hotel room (or home) together ALL DAY. I hope these help you as much as they have helped and entertained us. Museums Galore: I admit I have not had a chance to check out the numerous museums in the area, but they are on the short list for us to start checking out. If you are interested in museums, check out The Phuket Mining Museum, Phuket Trick Eye Museum, Thai Hua Museum, The Phuket Seashell Museum, and if you are really into postal stuff, the Phuket Philatelic Museum. Go to a movie:Depending on the age of your child, there is often a movie that you could see. There are a range of different types of seats (including first class seats that are sofas!) and all the prices are pretty fair (in comparison to the prices in America). Often times movies will open in Asia first, so you may get the chance to see a movie before it premiers in America! There are numerous movie theaters around the island, so I would suggest just googling “movies in Phuket” and finding the one nearest you. My hope is that your time in Phuket is filled with sunny days and outdoor fun, but if it rains I hope this list helps you keep your family happy on this amazing island! Now it’s your turn! Which would you chose to do if it was rainy in Phuket? What do you do for fun when it rains where you live? Leave a comment and join in the conversation! Kids Club sounds like a lot of fun! And Kidzoona. And I always love to go see a movie (even though we never do go). Hope it drops a few degrees for you soon! When it rains here…hmmm. Boring. We stay inside and do a good day’s worth of school. They hate rain! We generally kit the libraries on rainy days or go to a museum. Btw, this is an awesome list of resources for visitors AND locals!! Well done! WHAT! A Postal Museum? hahahah, guess where we are going! Love your list. I think they are great thought starters for any location. I love how good you are about getting out and about! This is such a great list! They all sound like so much fun! I would love to find a theater here with First Class seats-that would be so nice! It’s been blistering up North. But we’ve had massive storms for 2 nights in a row! Wooohoooo. PS Jen, just want to let you know that I do read and enjoy your blog as much as I used to :). I don’t comment as often as there is something weird in the connection from my phone: it doesn’t let me comment. I can like and there is the field for commenting but I can’t post the comment. And this problem (as far as I noticed) seems to only appear from my phone to your blog, wonder if anyone else has had the problem? Anyway, you know how it is when you read something, and you have something to say but can’t, and then you think you’ll get back to it but you never do…? In short: just keep the posts coming!